A modern aesthetic and green materials shape a low-impact house. It takes no small leap of faith to build a forever home from scratch. 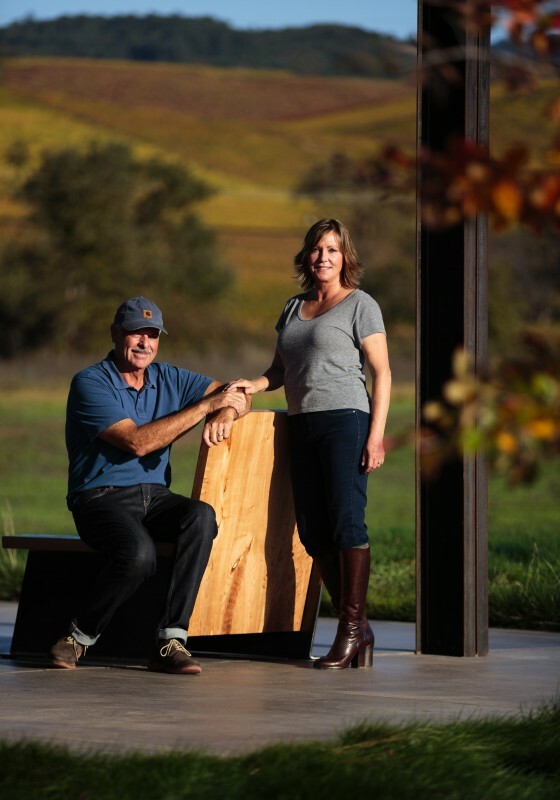 But that’s exactly what designer Jim Simmons and his wife, Susan, did four years ago when they bought an empty, overgrown lot on the edge of the rural Sonoma Valley town of Kenwood. “I knew the second I got out of the car. We both had that warm feeling of being exactly where we were meant to be,” explains Susan. 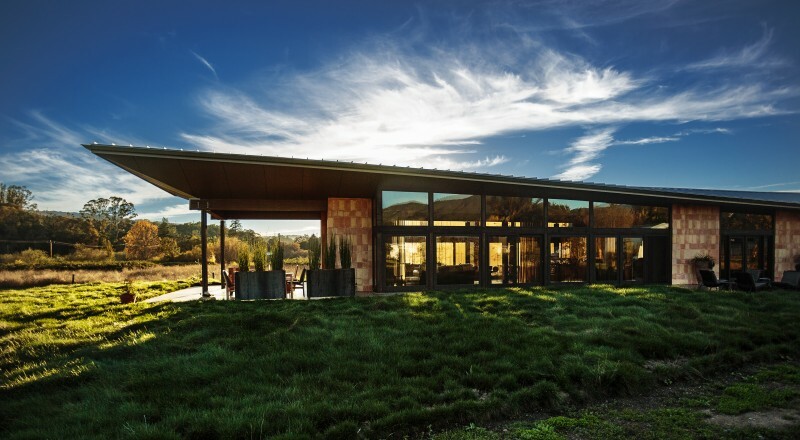 Together, the couple cleared away the scrub and designed their dream house, a 2,600-square-foot modern ranch that sits lightly on the land, with glass curtain walls and a dramatic winged roofline that echoes the surrounding hillsides. 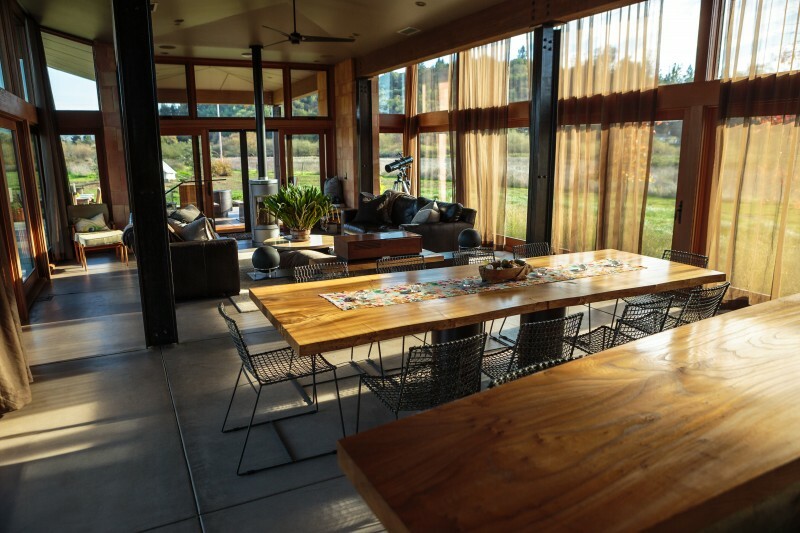 The home is entirely off the grid, with solar panels on the adjacent barn and a passive green design to regulate temperature using wide roof overhangs, thicker-than-usual insulation, and doors and windows that slide open to capture the breeze. Eucalyptus cabinetry and a simple, repeated palette of natural textures mean that the home, while streamlined, doesn’t feel at all stark. 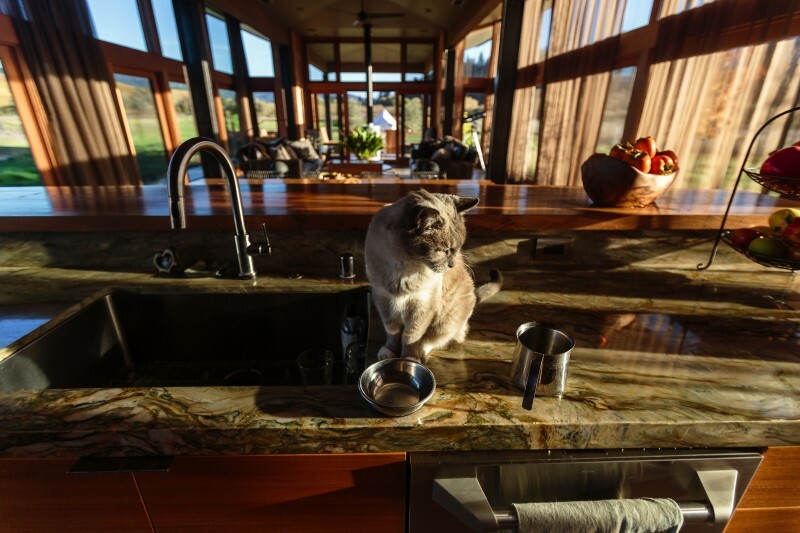 Instead, it’s a perfect reflection of its rural setting, right down to the swirly green and gold color of the countertops. 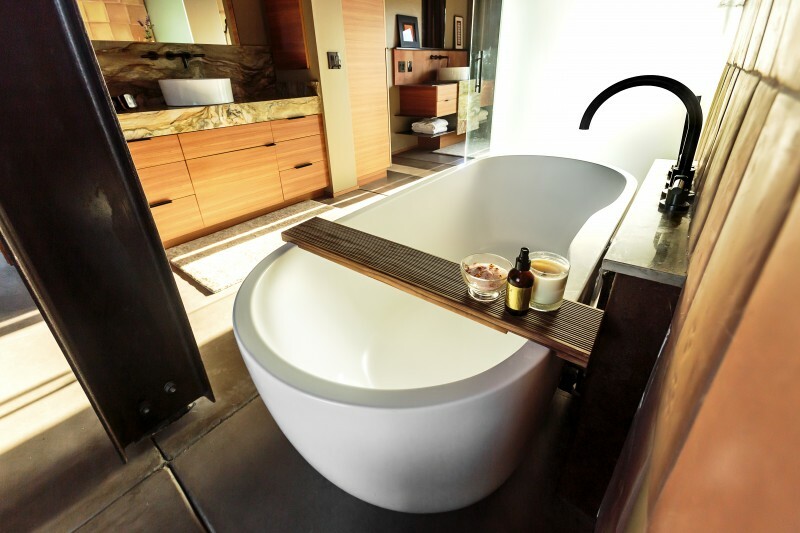 The curving standalone tub in the master bath has a saltillo tile backsplash and looks out to the hills. 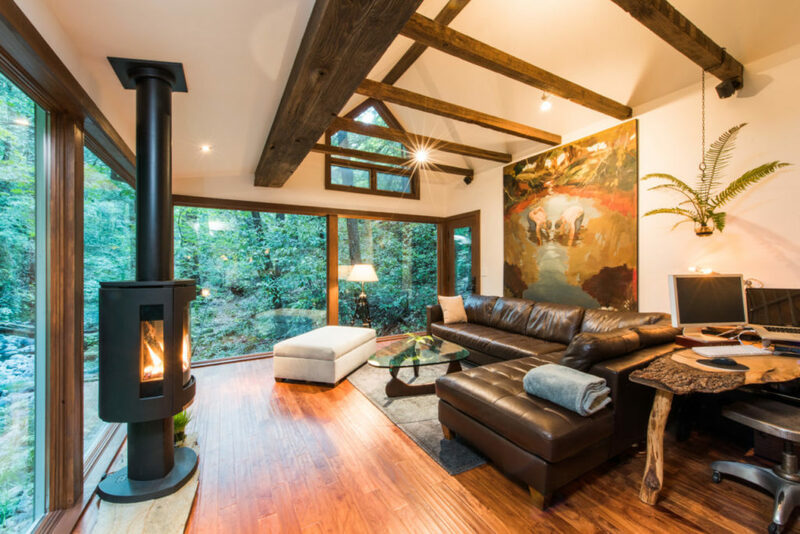 A freestanding European-style wood stove keeps the great room comfortable during tumultuous winter storms that sweep through the valley. “The wind blows, the clouds are going by, the rain is pelting the outside. A big storm gets the whole house humming,” says Susan. 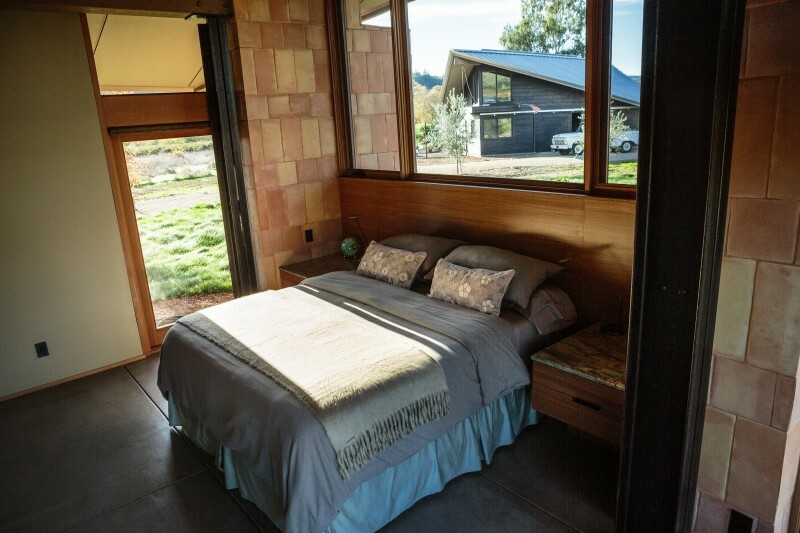 The couple’s two grown sons helped with construction and still visit often, bringing college friends to stay in guest rooms tucked in the top of the barn. Younger son Cameron built a live-edge dining table, benches and desks from a huge slab of reclaimed elm. 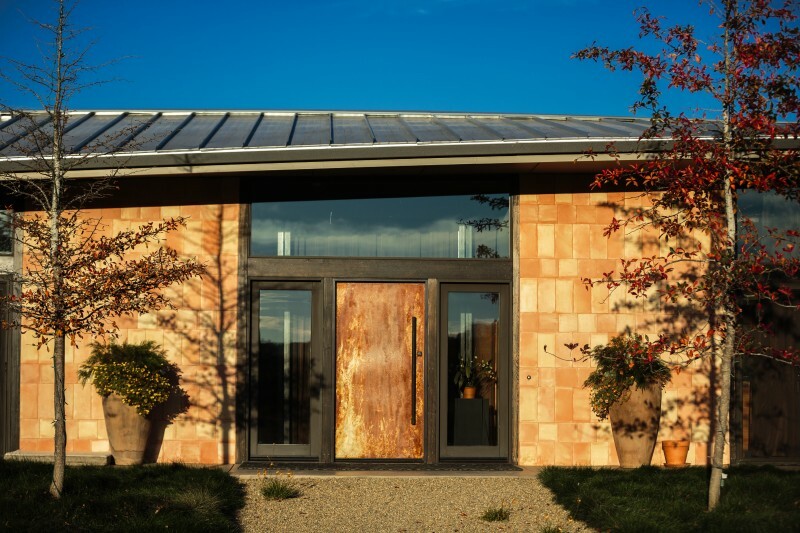 He also researched traditional Japanese charred wood, sho sugi ban, which was used to preserve the cedar on the exterior of the house and barn. 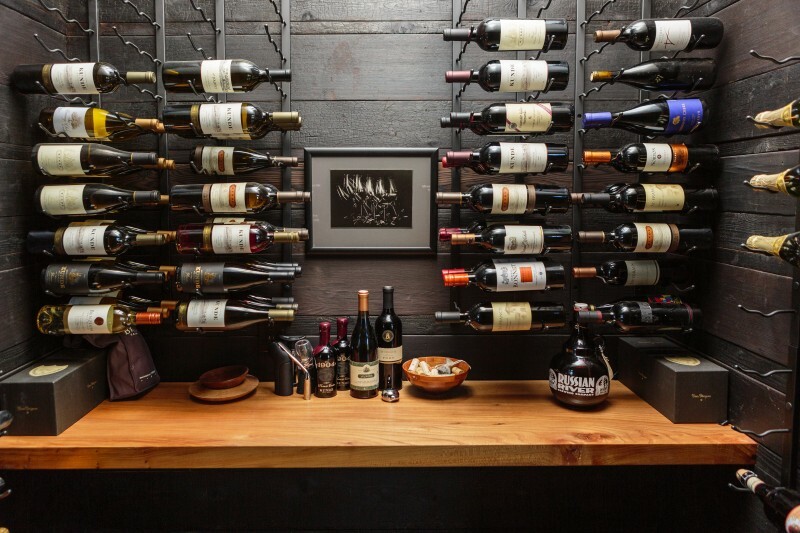 The wine closet is tucked away near the entry, just off the long main hallway. 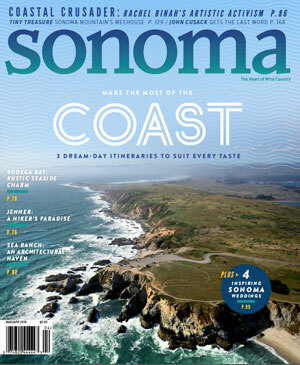 Local Sonoma Valley wines are a favorite. Jim’s overall design goal was to show that off-the-shelf materials could be used in an innovative, custom way. The beams, concrete floors and Douglas fir doors and windows were all standard sizes and available at local stores. This practical-but-beautiful approach is one of the main reasons the couple are so satisfied with their hard work. “We love our community and think we’ll be here a very long time,” says Jim. Susan knew exactly what she wanted for her kitchen and chose the distinctive green-and-gold onyx countertop and backsplash before Jim was finished designing the room. 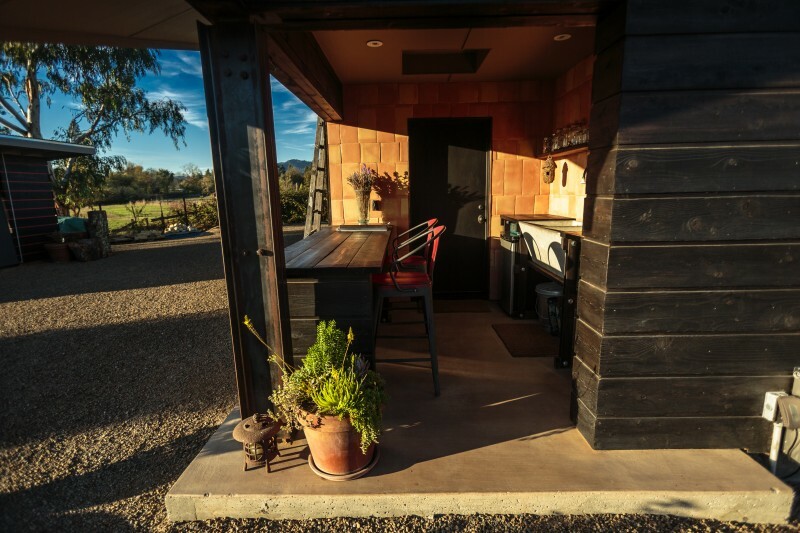 The layout works for both everyday and entertaining, with bar seating, deep sink and efficient appliances that don’t drain electricity too quickly — important when living off the grid. An adjacent walk-in butler’s pantry keeps the working zone of the kitchen clutter-free. t’s simple and serene in the master bedroom, which repeats the same soft sage greens and saltillo tile of the great room. During storms, rain is channeled along the roofline to this corner near the bedroom before pouring off the roof “like a firehose,” says Susan. The water is then directed into a single deep cistern that recharges the aquifer under the marsh.